Explanation: What is this meteor doing? Dynamically, the unusually short and asymmetric train may indicate that the sand-sized grain at the centre of the glow is momentarily spinning as it ablates, causing its path to be slightly spiral. 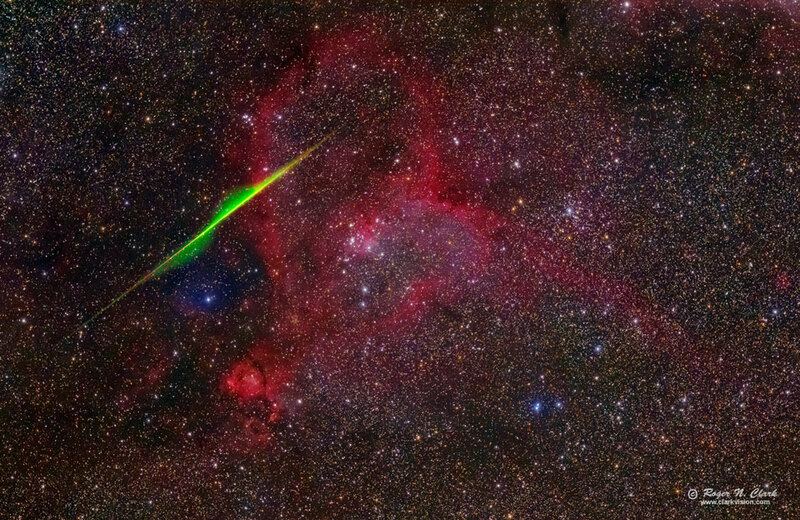 Geographically, the meteor appears to be going through the Heart Nebula, although really it is in Earth's atmosphere and so is about one quadrillion times closer. Taken last month on the night of the peak, this meteor is likely from the Perseid meteor shower. The Perseids radiant, in the constellation of Perseus, is off the frame to the upper right, toward the direction that the meteor streak is pointing. The Heart Nebula was imaged in 18 one-minute exposures, of which the unusual meteor streak appeared on just one. The meteor train is multicoloured as its glow emanates from different elements in the heated gas.